What Does the Fiscal Cliff Fallout Mean for You? 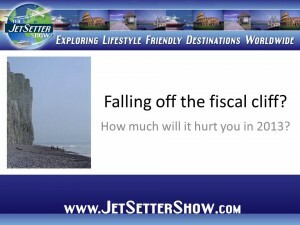 January 8th, 2013 by The JetSetter Team | Comments Off on What Does the Fiscal Cliff Fallout Mean for You? Many JetSetter readers use the passive proceeds generated from income property investing to finance the globe-hopping lifestyle they prefer. The recent “fiscal cliff” debate and final “deal” that took place in Washington DC will ultimately impact many real estate investors in the pocketbook. For that reason, we wanted to take a few minutes to discuss who’s going to see higher taxes and how much. The good news is that some tax cuts that pertain to income property owners were left in place. of the new plan, $400,000 marks the dividing line between incomes that will see a tax increase or a tax break. Those making more than this can expect to see a rise of 20 percent in taxes on capital gains and dividends – those with incomes below this magic number will still be taxed at the old top rate of 15 percent. And with the expiration of Bush-era tax cuts, those in that $400,000 and above group will see incomes taxed at a top bracket of 39.6 percent. thy hardest. An inheritance of under $5 million is exempt. But anyone fortunate enough to inherit more than that can expect to encounter a tax rate of a whopping 40 percent — up from 35 percent in previous years. Lawmakers also tinkered with the Alternative Minimum Tax, or AMT, a measure put in place to establish a floor under taxes paid by the wealthy. Because previous versions of the AMT failed to index the tax threshold to inflation, the threshold might have fallen low enough to penalize middle class taxpayers. The new version of the AMT links the tax threshold to inflation, limiting it to those in higher tax brackets. For property owners, though, there are a few bright spots remaining. The new deal kept the mortgage interest deduction in place; a key perk among the tax breaks offered to owners of residential and income property. And struggling homeowners dodged the bullet of new taxes on mortgage principal that’s forgiven in a short sale or loan modification. Eliminating this tax break would have placed an additional burden on homeowners already in crisis, and financial experts feared imposing such a burden might jeopardize the slowly recovering housing market and economy as a whole.